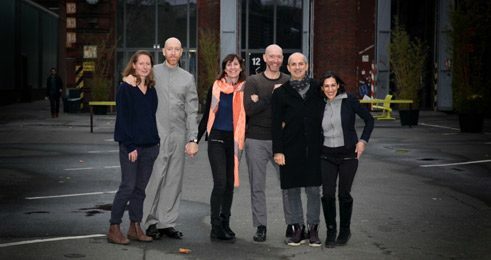 Six dancers from four nations, all of them in the 40+ age range, form Germany's new Dance On Ensemble. Structured similarly as the government subsidized youth group Bundesjugendballett this four year pilot project is the first official attempt in Germany to broaden the awareness for dance in an aging society. 45-year old American Christopher Roman, former dancer and acting director of the Forsythe-Company, has been appointed dancer and Artistic Director. Mr. Roman, it used to be: Primaballerina marries wealthy admirer or opens a studio at the end of her dancing career around the age of 32. Margot Fonteyn, Marcia Haydée or Sylvie Guillem, Michail Baryshnikov and Merce Cunningham were world-famous exceptions. Nowadays more and more dancers seem to want a chance to dance on and on and on. What's behind it? There are quite a few dancers today, such as in the Forsythe-Company, who are in their forties, fifties or even sixties. Dance is not just a physical engagement, but can also be an art. Our bodies become limited, so the expression is more directed. We speak through our bodies, tell stories with it, relate experiences. At the Forsythe-Company we never talked about aging bodies, but it was often clear that we were able to express ourselves adeptly in a creative process as we matured and developed our skills. If I, at age 45, cannot manage a high double cabriole like twenty years ago – so what? I am more interested in being part of a creative dialogue through dance. What is special about Dance On? It is an attempt to demonstrate to society the value of experience and maturity and embodied knowledge – in all fields of life. In collaboration with particular researchers we will make an effort to evaluate the importance of body movement, mental alertness and aging. Also, while we tour, we will offer workshops for amateurs, hoping for a vivid exchange of ideas and experience as well as address obstacles that the senior community face on a daily basis. We also aim at adding a new dimension to the versatility of expressions and impressions in contemporary dance. So we really want to be part of the dialogue between artists and the society as well as between the young and the mature dance community at large. Whose idea was Dance On? … picked it up, expanded the mission, found the means to realize it and heads the entire project. The government guarantees support with 1,5 million Euros for four years. Some 230 dancers from all over the world applied for the five open positions, I understand. How did the jury make the final choice? It was really, really tough, but the audition of 25 finalists turned out to be just about the most exciting couple of days in my career. Previously we had watched videos and read biographies to no end. Most of all we were fascinated by descriptions of why they wanted to join. Time and again we received a similar thread of desire, as my Spanish colleague Jone San Martin put it so beautifully: "I want to create new paths that could assure dance a future and a longer life contained in our bodies. Dance reaches beyond our bodies. It's a question of transgressing limits". I just needed such intelligent people who want to continue to dedicate their lives to dance. In addition to yourself and Jone San Martin the company now includes Brit Rodemund from Germany, Ty Boomershine from the United States, Amancio Gonzalez from Spain and Ami Shulman from South Africa. How are you working as a group? Mind you, we are at the very beginning of a long journey. We will begin operations in November and come together as an ensemble for the first time. We are all beyond excited to get started and begin creating together. Between us (he chuckles) we have 180 years of experience! We possess a whole toolbox of possibilities, thus can make decisions on experience and we know and respect our limits. In working with the 12 choreographers and artists we will collaborate with over the next 2 years we need to be able to adapt quickly and are prepared through this prolific range of skill to generate ideas for the collaborations and choreographies. I believe as artistic director, I will facilitate a certain environment that will allow us all to work to our fullest potential individually and as an ensemble and I will rely on my colleagues to be self sufficient and responsible artists of high quality and intelligence. We'll rehearse and create in the Ufer-Studios in Berlin and tour nationwide and internationally presenting our productions and workshops by invitation. Places and institutions like tanzhaus-nrw, Theater im Pfalzbau Ludwigshafen and the Berlin Festival Tanz im August have booked us already for the second half of 2016. But we will need to build a repertoire, so some producers are still waiting to see what we will create to be able to include is in their programming. The response to the initiative has been overwhelming and presenters and producers have invited us purely on the strength of the mission and its importance in the dance landscape. The first production, "7 dialogues", is going to be presented in January 2016 – possibly not by sheer coincidence in Den Haag where Jiří Kylián wrote dance history with NDT III, the senior company of Nederlands Dans Theater which unfortunately folded in 2006. We certainly are very happy to start out at such a renowned event as Holland Dance Festival. But in these days and times such a choice is made for quite simple reasons: you go where the interest is. Most certainly there is a particular awareness in the Netherlands for the special qualities of 40+ dancers, which may be the reason we were booked sort of as a pig in a poke. Definitely this particular invitation is for us the icing on the cake. The Dance On Company is not only dancing. As you mentioned, you also offer workshops labeled "Dance On Lokal". Aging is an ongoing process for every person. Everyone keeps changing all the time. Body and mind are constantly in motion. So we'll work with amateurs trying to find out and discussing how body and mind work together. What are your hopes for the Dance On Company? I don't want us to be a novelty or circus act. We want to do relevant work and be part of a dialogue that makes clear that every human being still needs a body to move physically as well as mentally and has the possibility to contribute and create valuable work. Marieluise Jeitschko conducted the interview. She works as a free lance writer on dance and cultural affairs.